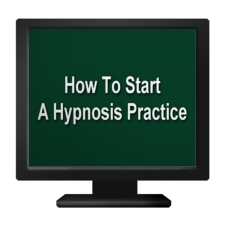 Starting A Hypnosis Practice Just Got A Whole Lot Easier With . . . Same Time & Money & Get Rid Of Frustration--Get Your Practice Rolling Now! Feel like sitting around for a few days and making up a bunch of forms? I bet you don’t. Save yourself tons of time and lose the frustration. We’ve got lots of pre-made forms to save you time–just add your business name and modify for your own use. There’s an intake form, an acceptance form, client confidentiality and disclosure forms and referral and release forms. You also get two examples of note taking formats to use, a full code of ethics, and a guide to hypnotherapist and client’s rights and responsibilities. I put all this together to make it easier for you. There are several checklists included in the course to help keep you on track and let you know what to do next. Say goodbye to overwhelm and hello to action. How about an easy to use spreadsheet program that will make calculating the profit potential of your practice a breeze.? Just type in a few numbers and you’ll be able to see just how much you could make. Most people skip this crucial step, and relegate their practice to the junk heap. You need to know how much you need to profit, if you're going to know what to charge. This calculator makes it easy. ? An intake form is where you gather the initial client information including contact info and what it is they want to work on. Need one? You’ll get it here. Fully customizable -- and your own logo and graphics, or just type your own, using the samples as guidelines. ? Where there are answers I don’t have, I’ll turn you on to resources that can save you time and money. Or I’ll give you insights on what to look for to get going efficiently. Here’s what’s covered. What Issues Do You Want To Work With? Though not a full-fledged marketing course, we’ll help you to understand what makes effective marketing and keep you from making mistakes that have cost others thousands of dollars. A handy little profit calculator you can use to make income projections. Just type in your projected expenses, the number of sessions you expect to generate and how much you’ll charge and voila! You’ll see your net profit. If you don’t have a way to do this now, how are you going to figure it out? 23 videos covering business finances, what to charge, specializing, office space and a lot more. The videos are 2 – 9 minutes long. They’re packed with solid, actionable information.